The concrete upon which your home stands can fail and crumble just like any other structure. It's important to address any home foundation issues quickly with crumbling foundations costing homeowners in Connecticut as much as $150,000 to stabilize the foundation of their home once again. Contact us today to get the foundation of your home inspected by professionals! There are several reasons why concrete fails to bond together that we evaluate during our foundation inspection process. One prevalent cause that has affected many residents in Connecticut is related to a mineral found called pyrrhotite. Pyrrhotite can cause concrete used for foundations, septic tanks, precast concrete products (i.e. hatchways, stairs) to fail by breaking down. The initial signs are called mapping cracks. Initially, mapping cracks are small and hard to see and eventually grow to be very large and cause shifting and movement to the product. Solution spray: This is applied to the foundation and highlights cracks that cannot be seen with the naked eye. This will help when looking to see if the foundation has started to react to the pyrrhotite and is in the initial stages. Core samples (or core taps): This is when an approximately 4″ round sample is taken in 2 locations of the foundation and sent out for independent analysis from a lab of your choice. The hole is then filled properly to prevent leaking and the samples are labeled and sent to the lab. Once the lab evaluates the content they provide a report that provides the amount of pyrrhotite in the core samples. This process has been recommended from the state of Connecticut to get on the list for assistance. 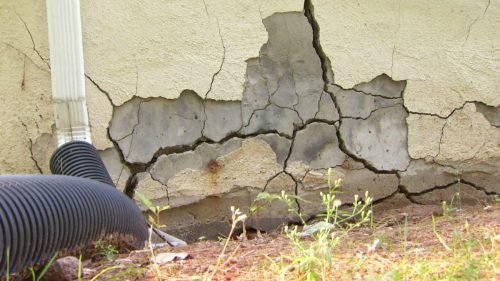 If you have noticed any cracks or instability in the foundation of your home, give us a call at 860-646-9983 and one of our inspectors will come out to provide you with a thorough inspection of the property's foundation. You will receive a detailed report and our inspector will take the time to explain any and all issues, so you'll know the extent to the damage and whether or not you need repairs. You can have core samples taken and sent to a lab for analysis to determine if the mineral pyrrhotite exists in the foundation.